Titan Industries is a power brand and the largest specialty retail chain in India. It is translating the success in watches into new categories by adding one every 5-7 years, and now also straddles jewellery, eye wear and precision components. Titan is at a very early stage of revenue and profit growth. Invest. 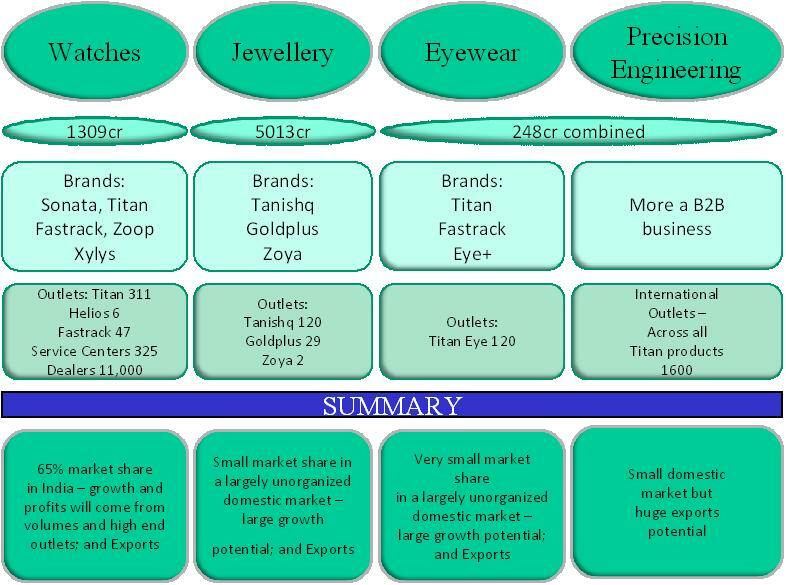 Titan Industries is a Tata group company selling watches, jewellery, eye wear and precision components. Titan has built excellent brands that drive sales in these consumer categories. They have also set up specialty retail chains to display these products and improve the customer experience. This chain is the largest specialty retail chain in India. Started in 1984 with a joint venture between the Tatas and the Tamil Nadu Industrial Development Corporation for watches, it expanded in 1995 into jewellery and in 2007 into eye wear. Today the turnover is 6050 crores, PAT 430 cr and sales has grown 35% CAGR over the last 6 years. In watches, the owned brands are Fastrack, Xylys, Titan and Sonata. High end licensed watch brands include Tommy Hilfiger, fcuk and Hugo Boss. There has been a steady growth in consumer demand except for 2008-09. Recovery is complete, and this trend is expected to continue and even accelerate. Watch parts which were sourced from China, are now being transitioned to production in house in India. This is due to increase in prices from Chinese parts. Even though Titan’s investments requirements and cost of production increase, this gives Titan greater control over the supply chain and quality control. 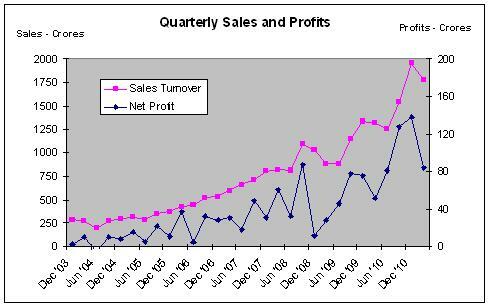 Sales are growing at 35% CAGR over the last 6 years. 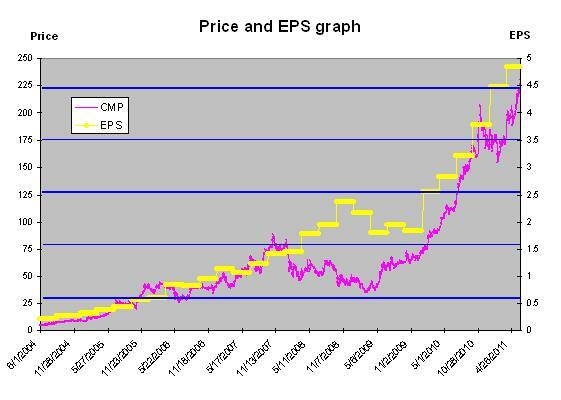 Over the same period, EPS (on a steady equity base) has grown 57%. This is remarkable profitability. However, cash from operating activities is up only 19.8% – this is because Titan is investing in building the retail chain as well as in the manufacturing facilities. Putting these together, Titan appears to be in a virtuous cycle of investment – growth – profits that (barring any India/ global slowdown) – is a multi year business acceleration. ROCE has been at an amazing 42-48% in the last 2 years. 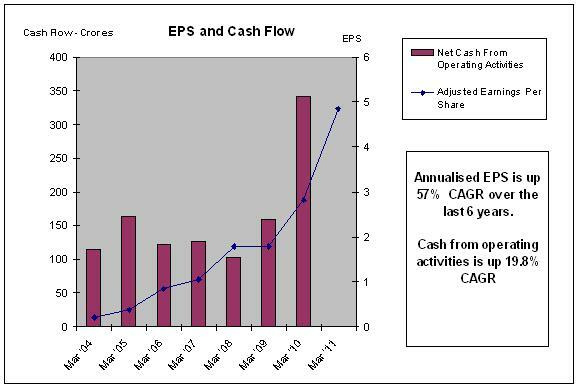 Very low debt equity ratio, and good cash position indicates strength in the balance sheet. The company has recently approved a share split to 1 Re face value (from 10Rs), and a bonus issue of 1 for 1 held. 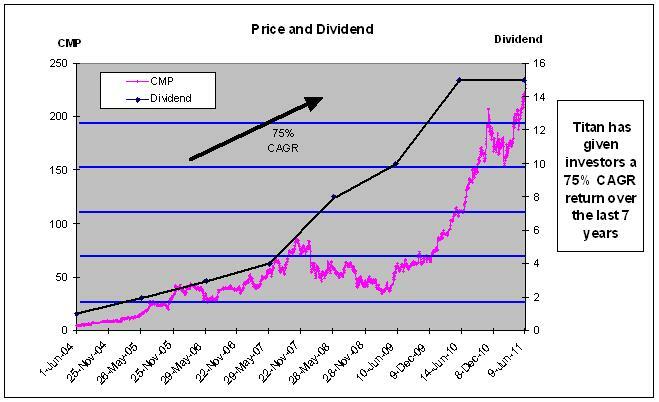 This will reduce market price by 1/20 and boost retail participation (and shareholder returns in the short run). Titan is seen as a proxy for gold. In recent times, Titan has been enjoying appreciation on the inventory due to gold appreciating. A fall in price of gold can be a risk to the gold inventory and the jewellery demand at Titan. Competition in India is intensifying with a host of jewellery and eye wear brands challenging Titan. Precision components is a commodity type business, needing volumes, compared to watches, jewellery and eye-care, which are branding, manufacturing and retailing oriented. This business may never reach profitability levels compared to the other three. So what next after eye care? In the next 2-4 years Titan needs to enter into a new business that falls in it’s sweet spot of takeover of unorganized sector – precision manufacturing – consumer retail where it’s strong brand can be deployed successfully. If it does not, business in India can taper off in the next 7-10 years. In India the ‘demographic dividend’ and GDP growth have pulled the per capita income to over Rs 54,000. Experts expect consumption to accelerate now, as consumers have more discretionary spending power, (and spend less of total income on food). Titan’s watch, jewellery and eye care categories will ride this consumption wave. In Jewellery and eye care, Titan is addressing a relatively unorganized sector, and by leveraging it’s national brand and distribution network, building credibility and loyal consumers. This is a sustainable model, and Titan enjoys a first mover advantage. Exports too are a big driver of future growth, as the Indian success story is replicated in 26+ countries. In these business categories, margins can be much higher in developed countries, so there is high potential here. Precision components manufacture, while being a lower margin business, has a very large global potential. Anecdotal evidence from Titan’s procurement for watch parts suggests that Indian parts are gaining in competitiveness compared to Chinese equivalents. In the last 2 years, share price has appreciated 4 times. For new investors, it may appear to be a case of, closing the stable door after the horse has bolted :-). 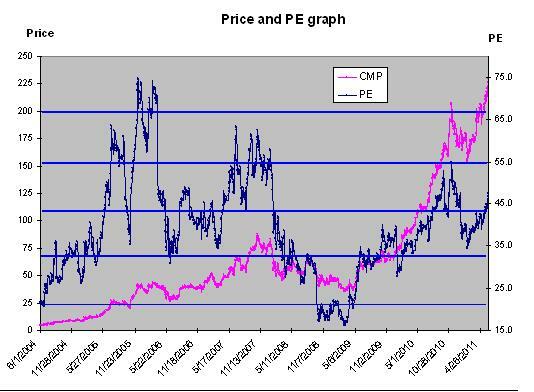 However, this stock is expected to continue to perform strongly for several years to come. Subscribe for Reports by filling the ‘Sign me up’ box on top right of this page.